In our CrossFit program we seek to develop world class fitness in our clients through the use of complex functional movements. The program is based on Olympic weightlifting, power lifting, gymnastics, and kettle bells. Achieving your athletic and fitness potential in this program requires a mastery of the foundational movements in CrossFit. In order to ensure that our clients are provided the best opportunity for success, we require everyone to get started at CrossFit Monolith in one of two On Ramp options which will cover the foundational movements that will be performed in the program. 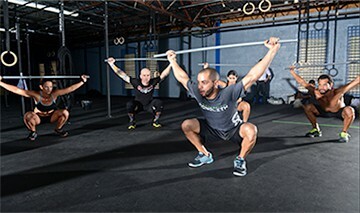 The On Ramp Program at CrossFit Monolith covers the nine fundamental movements that comprise the CrossFit methodology. Movements and skills will be taught daily and you will be progressively introduced to the intensity levels and exercises that are part of our CrossFit Program. Additionally, the program teaches you about the CrossFit culture, the nomenclature used in the program, and it helps to introduce you to our community. The group meets 4 days a week for a consecutive two week period. Upon completion of the program, you will be ready to safely and efficiently perform the daily workouts of our program. Click here and attend to our free try-out class with a One Day Pass for you and a friend and speak with one of our coaches about our On Ramp Program or our Private Coaching program.